I’ve spent the last 6 months researching the Chatbot landscape. I’ve spoken to many companies who have either built or have extensively evaluated the Chatbots in their market. Sadly I have come to the conclusion that there are rather a lot of bad Chatbots out there. Most of these bad Bots are found on messenger and would appear to have been whipped together by a couple experimental folk on the dev team without really giving due thought to where the user conversations were really going. I’m not going to name and shame, but if you look at some of the personality Bots on Messenger you’ll see what I mean. Bots within native apps by contrast seem to be much better “thought out”. In my opinion, it is the “thought out” part that is the key differentiator between good and bad, between genuinely useful and just silly, between helpful and simply pointless. So over the next few minutes, I want to share with you some of what, I believe to be, some of the key considerations that need to be thought out if you are serious about building a genuinely good Chatbot that moves the needle on your company’s KPIs. Whilst there are many business sectors that will benefit greatly and save operating expenses by deploying a Chatbot, I’ve decided to specifically focus here on Bots for retail banks as this is a sector that clearly stands to gain from the use of Good bots. 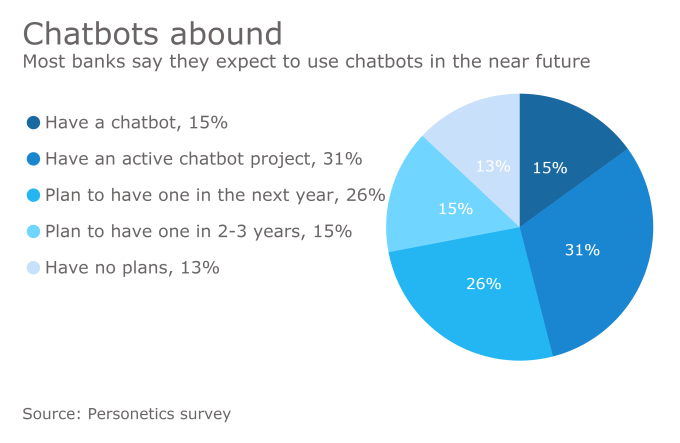 In their current format, Chatbots have really only been on the market for 18 months, but in that time many banks, large and small, have begun experimenting with them. The results from an April 2017 survey of major banks show that 46% either has a Chatbot today, or a pilot project. This sets the tone for everything that is to follow. From the outset you need to decide what the main purpose of this Bot will be; what will it say, what images will it show and how will the conversation end, or continue. Will it allow customers to do things that they can already do on your App or Website, and so maybe it is just giving people an alternative route to achieve the same outcome. You might decide to simply use the Bot as a tool to drive new customer engagement, such as a Bot that provides tips and hints, and after creating rapport with the customer, encourages them to do something more, like downloading an App. A good Bot should have 2 or 3 key goals and the Bot’s success against these goals should be easily trackable (more about that below). For example, the primary goal of your Bot might ultimately be to promote the sale of products such as credit cards or overdrafts, but from the customer’s perspective, the Bot is there to help answer questions quickly and prevent time wasted on hold to a call centre. If you do decide to design the Bot to be a Customer Service (CS) Bot then you will need to examine your customer FAQs and decide which ones are the most commonly asked, which could be answered by a Bot, and which will require hand-over to a human. Set your measure of success for the Bot accordingly! Whether you’ve labelled it as a pilot or not, there is a very good chance that this will be considered an experiment within your company. Whilst your immediate team might have been given the go-ahead to see what a Bot can do, there may not be consensus amongst the wider team that a Chatbot really makes sense for your company, so it is important that you set clear measures of what will deem this Bot to be successful. For example, in the case of a CS Bot, if you’ve built the Bot for Facebook Messenger and you currently get 500 queries a week on Messenger, then you might decide that your initial goal is to get 200 of these queries closed down by the Bot. If the goal of your Bot it so to get users to set up a profile (what services they are interested in, what locations they want updates about etc.) then you will want to look to your current website benchmark for this in order to set your goal. It may be that only 20% of new users go on to set a profile within the first X weeks, so you might decide that one of the main KPIs of the Bot is to get an additional 15–20% of users to set their profile, or to set it sooner. Ideally you should set several measures of success for the Bot. You may have decided on 2 main goals, a primary and secondary, so your KPI analysis might be more weighted around the primary goal. Make sure these KPIs are measurable and that you can view, for example, the incremental number of users who performed a certain task within a certain timeframe as a result of interacting with the Bot. It is important to come up with a clear picture of how this Bot will talk to your customers. Will it talk as a true Bot with it’s own independant (perhaps robot-like) characteristics, or will it be a Bot that represents a member of your customer service team, or perhaps a well know character within your industry (for whom you have the right to use their personality, that is!). Interestingly, the sign of a really well built Chatbot is when it’s interactors start assigning it human characteristics. For some reason, most of us are quite quick to treat a Bot like it is a human (even when our rational mind tells us it’s just a computer program we’re talking to). It is worth remembering this and taking advantage of this pre-conceived goodwill towards the Bot. You should consider whether your Bot will be strictly functional and just perform specific tasks, or whether you want your customers to have some fun with the bot as well. Some of the Bots on the market today have chosen to include some extra interactions like fun facts, jokes, humorous gifs etc. This will depend on the seriousness of your brand and the Key goals of the bot, but no harm in adding a little humour (if you can) to help the Bot build rapport with the customer. Regardless of the tone you choose for the Bot, you should consider the use of emojis, images, GIFs (suitable to the brand) as an alternative to text. This makes the conversation with the Bot seem a little easier and less formal, and sometimes the ideal response to a user’s text selection is to simply respond with an image. Once you have decided on the persona of the Bot, you should then consider what avatar you want to use for your Bot. Will it be your company or App logo, or an image of a character or real person in the company? At the same time, you should consider what you want the Bot to be called. Many of the Bots that exist today have the word “Bot” as the suffix so that is it clear to the customer from the outset that this is an automated service. Some examples include eBay Shopbot, Skycanner Bot, GrowthBot. Plenty of brands have also avoided deliberately mentioning the bot with names like “Eno”, “Ally Assit”, “SnapTravel” and “myAustrian Messenger Service”. During the process of thinking out what this Chatbot will do and how it will talk to customers, you need to give consideration to who within your team will “own” the Chatbot. This may end up being a team comprised of members from different divisions of your organisation. Someone from customer experience, some from the digital team, someone from the new business sales team. This team will own the job of really planning, designing and managing the Bot as it evolves over time, so team members should be chosen carefully. Before this team sits down to start drawing out a storyboard of the Bot conversation, I would recommend that they consider the key tasks ahead of them; document this plan and maybe even capture it in some kind of project planning tool. What will be the platform strategy? e.g. Facebook first or App first, then what? Who is responsible for the copy to be used? What should be the tone and language type to be used? Where will the conversation “flows” be managed and updated? Who will be in charge of managing / updating conversation flows? In my next blog, I will cover how to promote your new Bot, how the Bot might handle user authentication, and how it might want to handover to a human when the time is right. Deploying a Chatbot to your App, or updating your messenger service to now include this automated service has the the potential to breath some serious new life into your digital strategy, and potentially save a lot on operating expenses. Using a 3rd party Chatbot builder platform will take care of the majority of the technical heavy lifting, but if you are serious about delivering a longterm, and sustainable, customer engagement strategy, one that gets good reviews from Day 1, then you ought to set aside some real time to go through the considerations I’ve talked about.